Army Sgt. 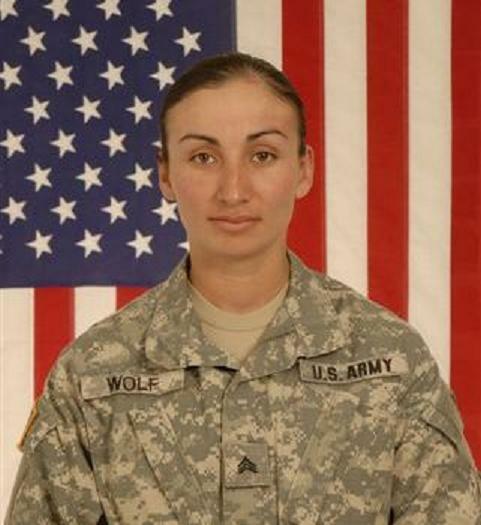 Eduviges "Duvi" Wolf, a 24 year old wife and mother from Los Angeles was killed in Afghanistan's Kunar province when insurgents attacked her vehicle with a rocket-propelled grenade on October 25th 2009. Wolf, who was from the City of Hawthorne and a graduate of Leuzinger High School, had a husband and two young daughters. She was buried in her husband's hometown of Farmer, South Dakota on November 3rd 2009. At the request of South Dakota Gov Mike Rounds, all state flags were flown at half-staff from 8am to sunset in Wolf's memory. Flags in California were at half-staff the week before. While growing up in Hawthorne, Wolf - who was then known as Duvi Preciado - was in the Hawthorne Police Department Explorer Program. She joined the Army shortly after graduating high school. At the time of her death, she was assigned to the Alpha Company of the 704th Brigade Support Battalion, 4th Brigade Combat Team, 4th Infantry Division, out of Fort Carson, Colorado. Her husband Josh, whom she met while at Fort Bragg, Colorado Army Base was serving in another unit in Afghanistan at the time of her death. He has since returned to South Dakota to be with the couple's two daughters, Valerie, 1 and Isabel, 3 who were being cared for by his mother.